It's Dilly Bag Show & Tell Time! Judy Newman's Dilly Bag pattern made making these bags a breeze. I think you can guess that I had a lot of fun picking out the fabrics. with it's fun heart circle bottom. It has happy word lining to whisper lovely things to the projects it contains, and a delicious pocket. By chance a lot of the feature hexagons on this bag have friends on them. A pair of children, a circus ringleader with his horse and there are some others on the other side too. 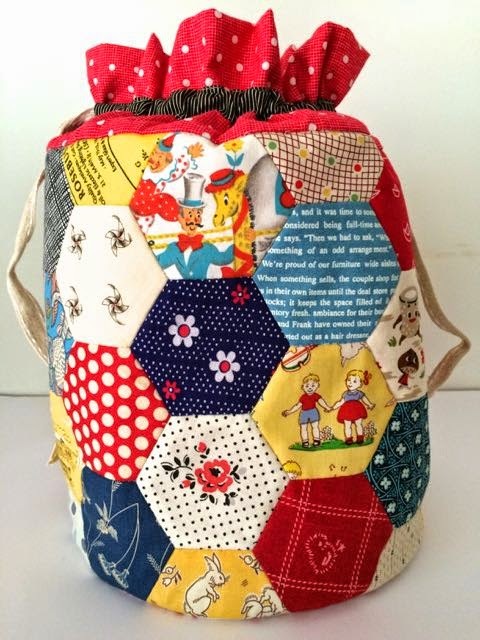 As I sewed these hexies together I came to think of it as the Friends Bag. This little teapot says it all. I love the whizz fizz summery colours of the other bag. It features happy things like bike riding and little scottie dogs, spots, dots and flowers. and a fussy cut flower underneath. Hidden inside is green leafy lining and more cute pockets. I couldn't decide which ribbon to use so I used a combo. 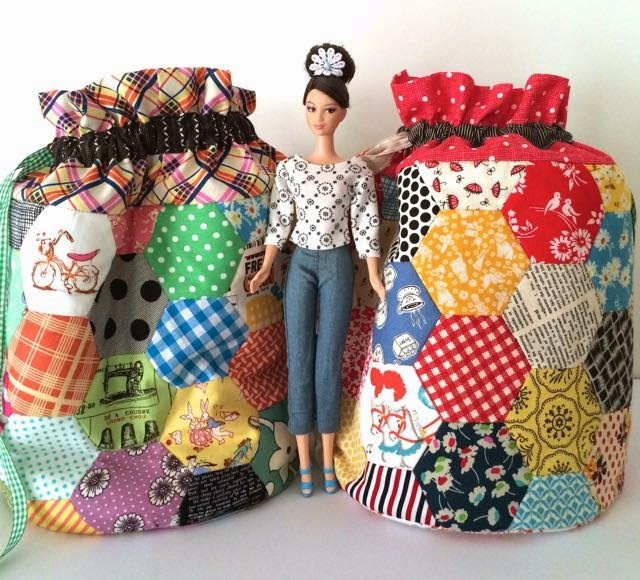 The bags are the perfect size for a carrying around a hand crafting project and it's notions , but it's tricky to be able to tell the size of things in photos sometimes so to give you an idea Rachaeldaisy Barbie offered to stand in as a model. If you're in the mood for a story here's a link to the Colourful Hexagon Adventure that I wrote last year inspired by these hexagons. This Giveaway is now closed - Congratulations to Dzintra, Queen Of the Armchair. There is a reason it's taken me a while to share these Dilly Bags. I've been saving them up as my blogiversary giveaway to celebrate my 5th year. One of these bags will soon have a home with one of my wonderful followers. Say "Yes please!" in your comment and tell me which one is your favourite, either the red top bag or the one with the plaid top. You must be a follower of Blue Mountain Daisy, it is a blogiversary celebration after all. New followers are of course very welcome. I'll happily ship anywhere in the world. I'll put the names into a Dilly Bag and draw a winner randomly in 2 weeks. that's the 2nd of May, 5pm Sydney time. Happy Blogiversary! Fabulous bags. Would be delighted to receive either one if lucky enough to win. Just signed up for your email. Yes, please! My favourite is the plaid top (but only by a whisker). Happy Blogiversary! OMG! I was just admiring your bags and at the end of the post was such a good news! I would love to win the Red Top bag. Happy Blogiversary! Lovely Dilly bags so yes please!!! And they both look great so I can't choose one! These are gorgeous. 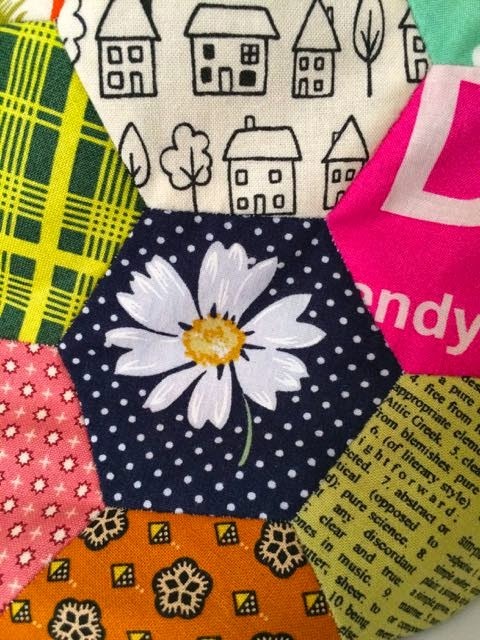 I do love the detail in all the fabric hexies. Such a lovely project! How can you bear to give one away? Of course I am going to say yes, please! And it is no surprise that I will say the red topped bag. I hope you have a lot of fun with your give away!! Yes, please--the red one calls to me. I'll use it to carry around my own hexie project. Thanks for the hexie adventure story. Oh yes please!! What a generous giveaway Rachael! I love BOTH your delightful dilly bags, but if push comes to shove (sorry, this giveaway could get ugly!) 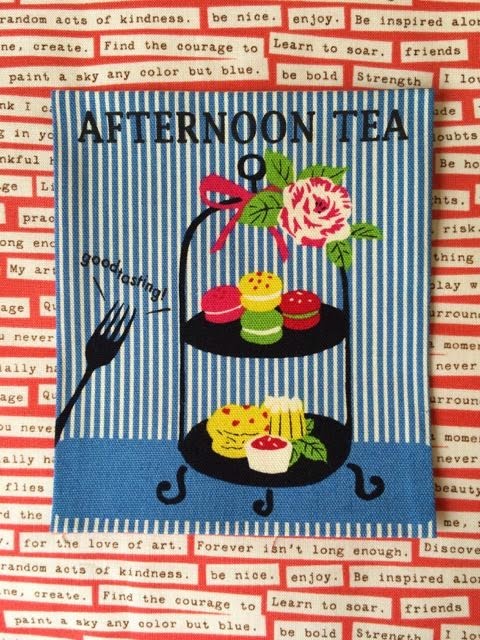 I think the red lining and its 'afternoon tea' pocket wins me over! I love Barbie as a model too- I might need to use one of mine in a fabric post! Happy blogiversary- I always look forward to reading about what you are up to! Yes, please!!!! They are both lovely, so it would be very hard to choose one. Perhaps the plaid topped one? But the red topped bag is equally pretty. Yes please..your bags are simply gorgeous, there is just something about a cute dilly bag, I think that the red top one is my favourite..it must be the spots.. and a happy blogiversary to you.. Yes Please, You have made it very hard to choose a favorite! But it would be the Red Top! Happy Anniversary! yes please! I love them both but would choose the red top bag! Happy Blogoversary, I'm a GFC follower! Your RachaelDaisy Barbie is divine! And yes, please - I love both bags (you have the BEST fabrics!! ), but would probably choose the red topped bag (even though the plaid has the wonderful bike with banana seat). Both bags remind me of the 'essence' of you!! These are too cute Rachael ! How many years have you been blogging ? Yes please!! I love the red one. Both your bags are darling! It feels like picking a favorite child to pick a favorite bag! I guess I'll say red. Hope you have many more happy years of blogging! Yes please! Love the red top bag! YES, PLEASE!!!! 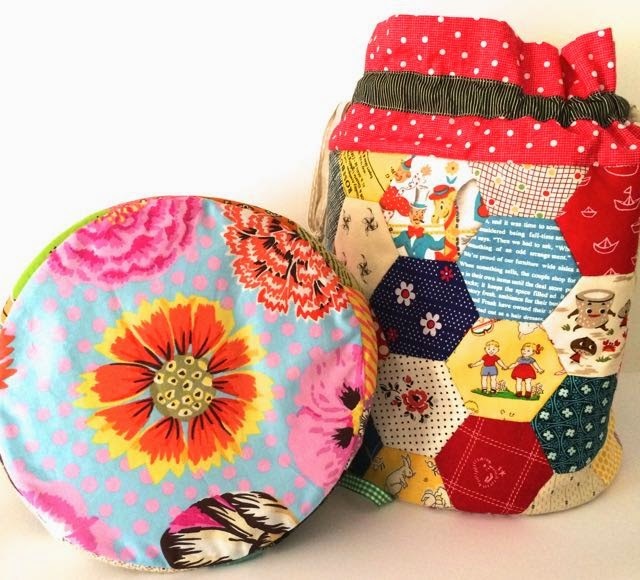 How could a quilter choose? 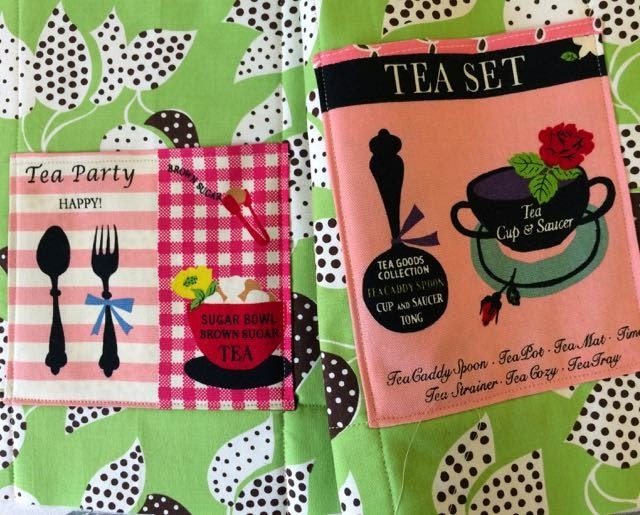 Both bags are perfectly adorable, and you do such a lovely job of fussy cutting and focusing on the sweetest part of each fabric. I love your attention to detail -- it is what sets you apart. In the end, though, I'm a "red" person, so if the choice must be made, I choose Red Top with all its happy pairings. Yes, please! Your bags are delightful and your give always is so generous. I'm loving the red topped bag full of friendly thoughts. 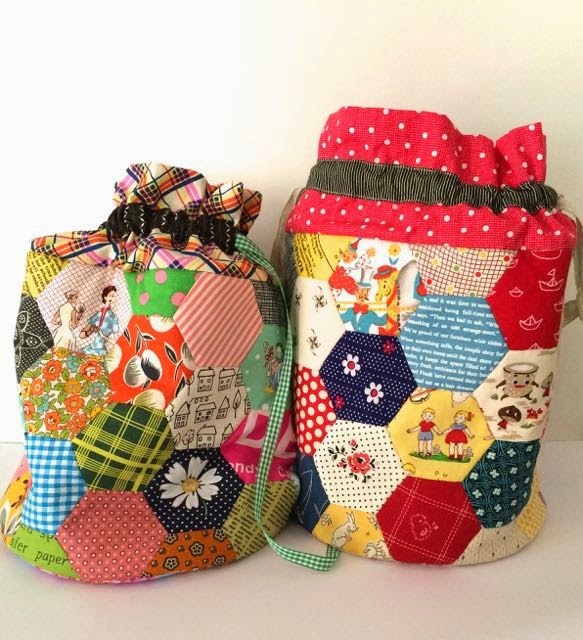 It looks like you had a lot of fun putting these adorable bags together! Yes, please--I would love to be the new owner of the red top bag--so cute! I am an email follower. Oh my gosh a thousand times yes please, lol - Rachel these are absolutely darling, cutest dilly bags ever in the history of dilly bags!!! I love Red Top the best - that pocket put it over the top for me! Oh you clever girl. Love your barbie too - I wish I still had mine, she didn't move at all but I loved her! And I think she had blue eyeshadow, lol! Yes, yes, yes please!!! I would LOVE a RachaelDaisy original! Oh Yes Please, Your bags turnd out absolutely wonderful. I did follow your story and found it delightful. 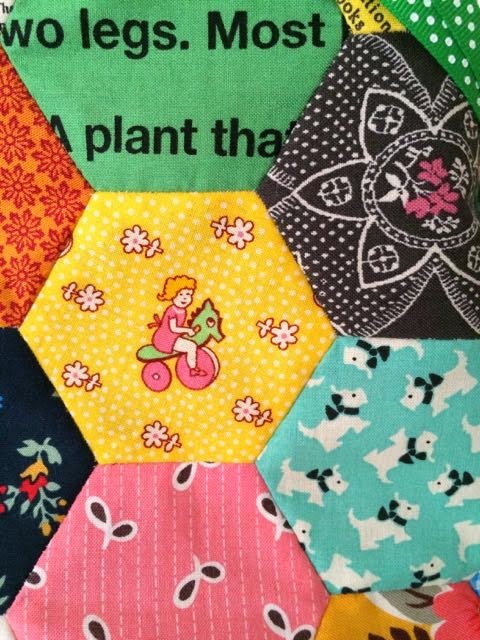 I love making hexies,too. Both the bags are so cute I guess if I had to choose number 2 .Thank you for the opportunity to possibly win one. Yes, please!!!! I love them both but if I'm the lucky one, the red topped one would be my choice. Thanks for such a wonderful giveaway! WOW dear Rachael - Yes... please! I love both of your bags, they are so cute!!! Thank you so much for this wonderful giveaway. Yes, please :) Would love your adorable red Friends Bag to be mine…it would have a special place in my sewing studio for sure!!! Happy Blogiversary and thanks for the sweet giveaway :) I'm already one of your followers! Congratulations and I hope (selfishly) that you'll have many more years with this blog! Yes, please. Love them both, but the plaid won my heart because of the tiny Scotties! Oh what fun! Happy blogiversary. You always bring smiles and inspiration to my day. No need to enter me. I love the bags, but I feel you've been too generous with me already. 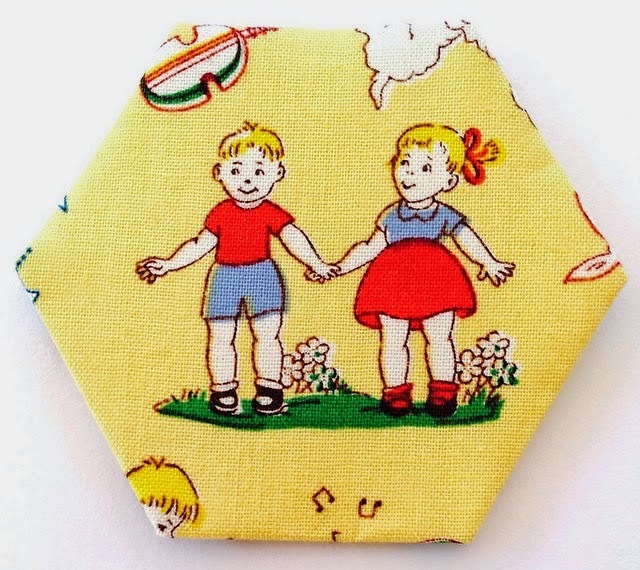 Every time I peruse my vintage fabrics, there is your sweetness! I love the red top! Yes, please! I really like the red top bag with all it's friends. And hey! My birthday is May 1st! wink, wink! ;) just kidding. Yes Please Rachael, I can't believe I wasn't already a follower of yours but I just checked and signed in. Both those bags are lovely but I'm drawn to the polka dot and Scotty one. Love the flower on the bottom. Thanks for a lucky chance to win one. Thanks for all your lovely comments on my blog when you visit. Oh Yes Yes Please, I love them both but I think the plaid top one in calling my name. Thanks! I'm sure it's your sense of fun and whimsy that inspires you and in turn all of us.keep quilting, keep blogging and keep enjoying life. Yes, please! And thank you! Love the red topped one because red is my favorite color. Plaid top bag! These are so sweet. Happy Anniversary to you and your blog. Yes please....I mean why would you not? 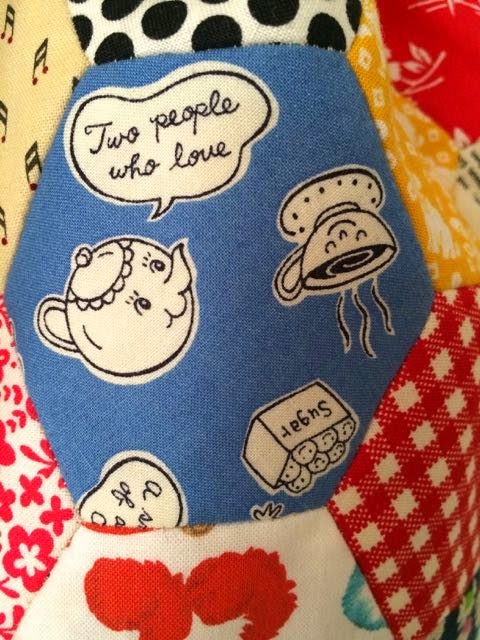 I have a few of those feature fabrics, we defs have the same sense of humour I reckons. 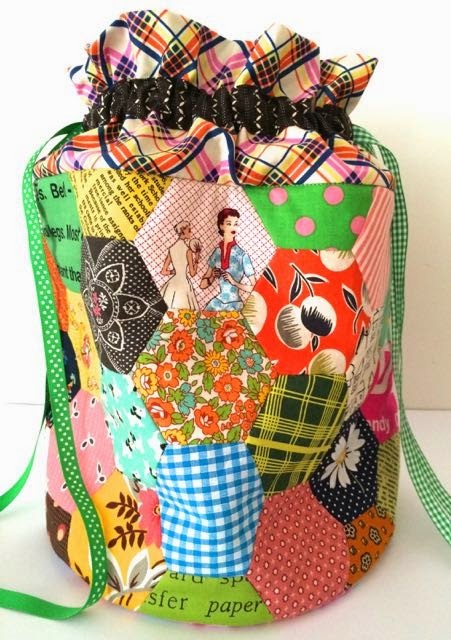 Just picked up a Judy Newman quilt kit at the show here in Melbourne...its the Alice in Wonderland with Liberty accents ...be still my beating heart...actually not too still, cos I may faint. The bags must have been fun to make. What awesome bags RAchael...so very you! Love them both but I hear the red topped one calling my name! Yes please! Thank You for a fun giveaway to celebrate your Blogaversary! "Yes please!" I love the red top bag, it makes me happy looking at it. Thanks for the chance to win your giveaway. Yes Please. They are both so nice its very hard choosing. I guess my favourite would have to be the plaid topped one. Whizz fizz is the perfect way to describe its colours but I do love the friends on the other one too. Congrats again on your blogaverary. I really hope to see you next week at the quilt show. "Yes, please!" I'd love to have a chance at the red bag and thanks so much for doing this :-) Great, fun fabric choices. Yes please! So difficult to choose, but I think the red one! Eany meany miny mo.... soooo hard to choose between these cuties. Although which ever one has The Cat in the Top Hat hexie would be my choice. What fabulous bags! Love the circular bottoms. Think I slightly prefer the red top, but both are gorgeous. Happy blogiversary. Yes please! They are both so gorgeous but I think the plaid top one is my favourite. Thanks for the continued inspiration. Happy blogiversary! The bags are are so fun! You are so kind and generous with your giving. I love you happy notes and cheerful pictures of everything you do! Wish you many years of creativity Rachael! Many congratulations Rachael - you have such a fun and creative blog and it is always such a joy to read! 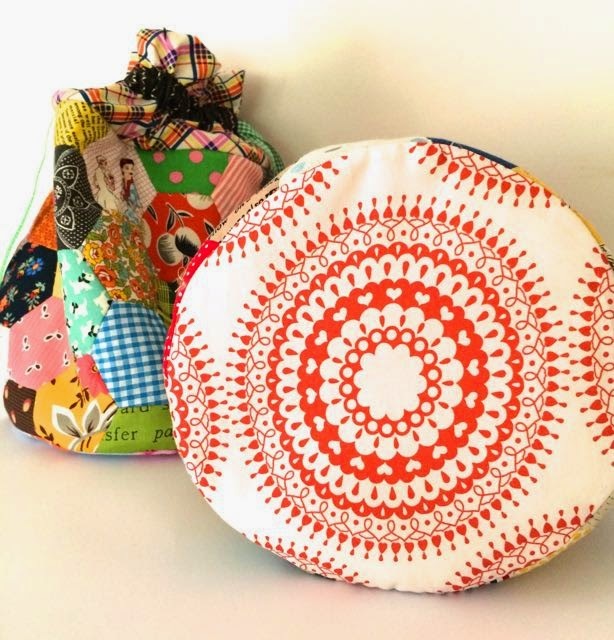 I would love to win one of your Dilly bags - I would let you choose for me because they are both amazing! You know how to put fabric together and how to spread JOY! Both bags are so much fun and so happy. Congratulations! Love them both. ;) especially the second. Yes please! The red top one is my favorite, but both are amazing! These bags are an absolute delight!! how cute! you are too cute. I love them equally. I won your last kitten fabric giveaway, so don't add my name. I'm lucky enough to be your friend and to be inspired by all you do! Yes, please! You are kind to part with 2 labors of love. Both look like Friendship-bags to me! The plaid top has colors that make me sing and I love the two different ribbons (I can never decide either :=) so that one edges out the red-top teapot dilly, ever so slightly for favorite. Whoopsie! Well, giving one and keeping one sounds Much more reasonable. I know how long you've been working on at least the first one :) You better keep one! Yes please and of course the plaid top esp since I just finished a 3 day tartan weaving workshop!! A RACHEL DAISY BARBIE? she screamed! :) Thanks for the link to the pattern. Yes please. Thank you for the chance to win such a lovely bag. If I should be lucky, I would love the red top, please. Yes please Rachael, I just love the dilly bag with the red top - it reminds me of the one that I started and never finished last year (must get back to that! ), but yours is brighter. Thanks for the opportunity! Oh yes please for i am a plaid girly with a weakness for stories told in hexagons. Yes Please! 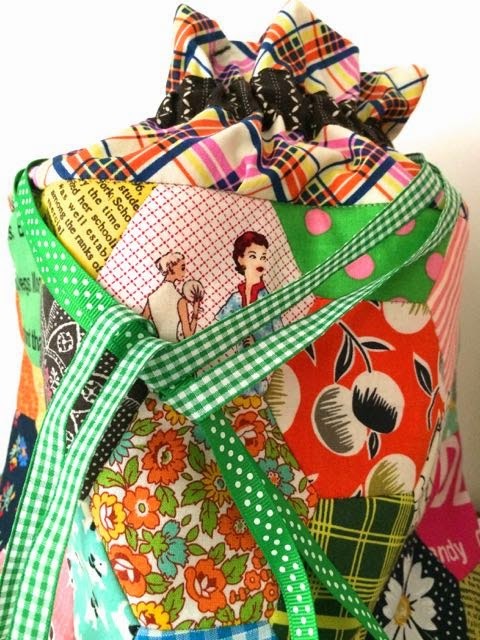 Your Dilly Bags are adorable -- how could one ever choose a favorite??? Happy Blog Anniversary!!! Happy Blogiversary! Yes, Please, if I must choose, I pick the plaid top Billy Bag!!! YES PLEASE. Just love them. If I was the lucky one maybe I could have the red. The little fabric stories are great. Yes please! After much contemplation, the red top, friends bag would be my choice. Thank you Rachael. Yes Please !!!! Love the red top dilly bag...as i love the little teapot. ..thanks for a chance in your giveaway! 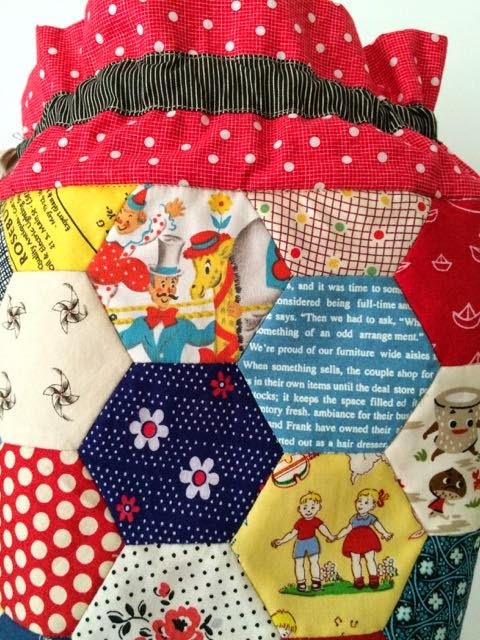 Such a wonderful treat to find this blog, read the story and enhoy the hexies! Love it thanks! Yes please, these are so cute! I love the red one but you know anything you make is super adorable. You have your own personalized Barbie? But of course you do! I am in awe! Yes please! Thank you for making these for us! I would prefer the one with the plaid top!